Benefit #1 :- Carrot juice contains less calories and is very beneficial for weight loss. Benefit #2 :- The functioning and health of liver and digestive tract improves by the intake of carrot juice. Benefit #3 :- Carrot juice contains Vitamin E which helps in preventing cancer. 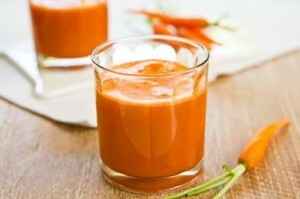 Benefit #4 :- Aches and pains associated with aging lessen with the intake of carrot juice. Benefit #5 :- Vitamin A present in carrot juice improves eyesight and helps in bone disorders, osteoporosis etc. Benefit #6 :- It contains potassium which helps against cholesterol. Benefit #7 :- Carrot juice is extremely beneficial for the liver as it reduces fat and bile in the liver. Benefit #8 :- The juice revitalizes and tones the skin. Benefit #9 :- Carrot juice is very rich in beta-carotene, which is an antioxidant and it prevents cell degeneration. The aging process is also slowed down. Benefit #10 :- Carrots contain beta-carotene, which is converted into Vitamin A by our body. This natural vitamin A is very good for our body.